Are you looking for a way to reduce more moisture and eliminate odours? While you may use your dehumidifier on a continuous basis, there is another option that will increase the effort you are already making. It is time to add the Unibond Aero 360 Refill to your existing dehumidifier for a boost of freshness. With the capability of lasting up to 3 months per tab, it is the ultimate in dehumidifying power. At first glance, you would think something so tiny couldn’t possibly have such a powerful effect on your home. The truth is, that if you have a room up to 20m², this option could be for you! If you are looking to dehumidify the bathroom, kitchen, bedroom and more, this is a great accessory to go with your dehumidifier. Lasting up to 3 months per tab, the Unibond Aero 360 Refill offers a special wave shape and an opening in the centre that allows for more air contact. This design enables it to boost the performance of the system it is placed in. The 2-in-1 patented technology offers the ability to absorb excess moisture and neutralise odours. It is composed of ultra-absorbent active crystals to provide maximum efficiency. You’ll find this product to be effective at preventing condensation, mould, mildew, peeling wallpaper, blistering paint, allergens and dust mites. This great accessory is the perfect addition to use with the Unibond Aero 360 that we’ve previously reviewed. It is easy to tell when the tablet needs to be replaced; it simply will be completely dissolved. Then, you can quickly replace it with another of your choice. There are several places that offer the refills for online purchase including Amazon, Argos, and ASDA. It is also available in several different options. You can choose from the neutral refills, lavender, Energising Fruit Sensation, and Bubble Spring Fresh scents. The nice thing is that you could choose a different scent each time you add a new tablet for a different experience. As with most products that work in the home, there are a few safety guidelines to be aware of. You will want to avoid touching the Aero 360 Refill with any metal surfaces. It could also easily damage your leather, fabrics or carpets. Make sure that children and pets all stay far from the tabs. If someone should come in contact, be sure that they wash their hands with warm water. 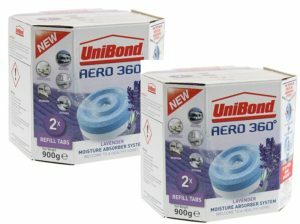 The UniBond Aero 360 Refill is a great option to add to your existing dehumidifier for continued freshness and moisture removal. There are different varieties that will appeal to everyone and they last up to 3 months long. What a great way to work on your mould issues with this handy little accessory.